Is it possible to suppose that the United States might finally experience its own perestroika after the end of the Cold War? I am not referring to the movement around Barack Obama's call for change, although that could potentially be a critical factor in reinforcing and sustaining the new phenomenon of perestroika. Nor am I referring to the financial crisis although that too could provide an impulse for transformation. Rather I am talking about the far reaching debate and indeed restructuring currently going on inside the Pentagon as a result of the wars in Iraq and Afghanistan. Links relating to this article and Mary Kaldor's other columns are available at diigo here. The end of the Cold War did not lead to the dismantling of the military-industrial complex, which continues to exercise a powerful and pervasive political, economic and cultural influence on American society. Military spending fell after 1990 and the number of troops were reduced but research spending on advanced military technologiesw remained at its Cold War level, thereby constituting a permanent pressure to develop and produce new weapons systems. Moreover the Cold War narrative (drawn from the experience of World War II) about the role of the United States as a global leader in promoting democracy against its enemies through superior know-how, continued to dominate security thinking. Indeed the narrative was reinforced by the widespread argument that Reagan's decision to deploy cruise missiles was what ended the Cold War and by the experience of the 1991 Gulf War, which seemed to prove the salience of sophisticated technology. Throughout the 1990s, the United States continued to emphasise the importance of airpower and rapid decisive manoeuvre warfare incorporating new advances in information technology as the cornerstone of American strategy. And defence intellectuals continued to draw up scenarios in which these forces would be used to repel a new range of enemies from rogue states to terrorists. Indeed the immediate aftermath of the invasions of Iraq and Afghanistan was characterised by a mood of triumphalism about the American Way of War and the relevance of concepts like the Revolution in Military Affairs, Defence Transformation, or Netcentricwarfare. Several years and thousands of casualties later, the atmosphere is very different. 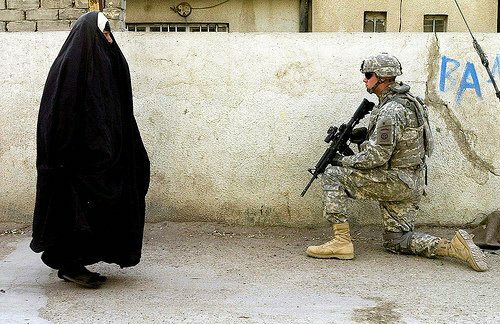 The worsening violence in Iraq and Afghanistan led to a serious questioning about the effectiveness of the US tactical approach. Moreover, despite the largest ever military budgets, there were shortages of troops and equipment suitable for ground wars because of the expenditure on large sophisticated systems. Many were arguing that success in regime collapse had created a vacuum of lawlessness filled by political insurgents and violent criminals and that efforts to attack insurgents using superior firepower merely increased opposition to occupation. 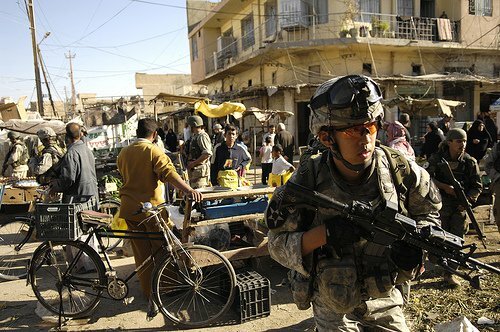 On 10 January, 2007, President Bush announced a new military plan for Iraq, known as the `surge'. The surge in Iraq was not just about an increase in troops, it was about a profound change in strategy and tactics, based on, to use the jargon, a population-centric approach. General Petraeus's `new thinking' emphasised, above all, the protection of civilians over and above force projection - a radical turn around in the way American forces are used. Instead of technology and firepower, the emphasis has been on bottom-up local security. His latest `Counter-insurgency Guidance' (published 8 July 2008) includes instructions like `Secure and serve the Population', `Live among the People', `Promote Reconciliation', `Walk', `Build Relationships', `Employ money as a weapons system', `Empower subordinates'. The reduction in violence in Iraq over the past year and a half was mainly due to the fact that Sunni insurgents overwhelmingly switched sides, choosing the US rather than Al Qaeda, which, in turn, was in part but only in part a consequence of the new policy of direct population security by the United States. Instead of remaining behind protected enclaves and using firepower to attack insurgents, which usually involved so-called collateral damage, US forces spread out to population centres, not only providing security, but also helping to provide basic services and humanitarian relief. It then became possible to negotiate ceasefires with Shiite militias as well. (some argue that this was possible because ethnic cleansing had largely been completed in Baghdad). It also became possible to start to build much more effective Iraqi security forces than hitherto, incorporating many of the veterans of Saddam's army who had been dismissed by Bremer immediately after the American invasion. 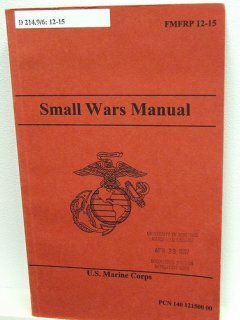 This strategy was, of course, combined with what is known as `kinetic force' to attack Al Qaeda as well as renegade Shiites like the `special groups' who did not respect the cease-fires; improved knowledge of the `human terrain' allowed the US to target these groups much more effectively. Of course, the `new thinking' is not uniformly shared. On the contrary, most of the US military retain what one `small wars' blogger describes as a `cultural aversion' to nation-building. In particular, the air force and the navy remain wedded to sophisticated systems capable of striking at long distance. In June, Robert Gates, the Secretary of Defense, dismissed the Air Force secretary and the air force chief of staff, ostensibly for `poor performance in securing of sensitive materials' ( it was discovered that four high tech electrical nose cones for nuclear missiles were sent to Taiwan instead of helicopter batteries -a mistake that is difficult to believe especially as it was not revealed for eighteen months!) But according to the New York Times, in a report that reflects the talk in the Pentagon, Gates was `frustrated about Air Force actions on weapons procurement, budgets, and the execution of the mission in Iraq.' It is the fact that there is a struggle going on and not simply a change of direction that underlines the character of what might be described as the new perestroika and offers the possibility of real change. So what are the implications of this debate and where will it lead? A first question is whether the reduction in violence in Iraq can be sustained. This depends not on what the US military do but on the politics of Iraq. Can the Iraqi government gain the support and trust of the population, which, in the end, is what makes stability possible? And, if not, and new violence erupts perhaps also involving the Kurds, will the old guard in the Pentagon be able to turn around and claim, as they did after Vietnam, that these military intellectuals messed up and what was needed was even more firepower? While many on the left would like to see the US defeated in Iraq and troops withdrawn in humiliation, this would have catastrophic consequences in Iraq and is likely to have perverse consequences for politics inside the US. On the hand, if stability is sustained, this could also strengthen the `new thinking'. A second question is will the new population-centric approach be adopted in Afghanistan? This month, General Petraeus becomes commander of Centcom, in charge of both Iraq and Afghanistan. At present, despite brave words about reconstruction, the main thrust of American and British policy seems to be to attack the Taliban at long distance, especially in Pakistan. As the situation worsens and spreads to Pakistan, can the Iraq model offer an alternative? Is it possible to apply the same kind of nuanced approach to the Taliban that could result in the marginalisation or isolation of extremists? And if not, what are the limits of the `new thinking'? Are we `faced' with what the conservatives call the `long war', which will justify the continued acquisition of all kinds of new methods of killing? And a third question, which follows from the first two, is whether the new approach can be used for global peace operations in the future or whether it is a more efficient form of American imperialism? Most `new thinkers' still insist that the US needs both a stability capacity and a war-fighting capacity. Indeed, some proponents of `new thinking' are suggesting that a capacity for both decisive military actions and stabilisation could enable the US to invade countries like Iran and Syria and simultaneously clean up the aftermath. At present, of course, US forces are much too over stretched but what if the US leaves Iraq and Gates succeeds in overall restructuring? This is why what happens in the forthcoming US elections is so important. The changes within the Pentagon need political direction. Are population security or stability operations viewed as a means to an end - defeating terrorists that might attack the United States, winning the War on Terror? Or is the goal population security globally, which might require the use of military force against those nihilistic terrorists or genocidaires who are not amenable to negotiation and who cannot be arrested? In other words, is the goal to protect the United States unilaterally or can there be a new understanding that American security depends on global security? In the first case, the `new thinking' continues to be viewed as a secondary or marginal activity for US forces. But if the aim is global security, the primary requirement is for a stabilisation capacity to end wars rather than fight them. The incoming President needs to articulate a new narrative for US security policy based on the notion that population security (or I would say human security) is a world-wide goal rather than the War on Terror and that the US will strengthen multilateral institutions in order to develop the capacity to prevent conflicts as well as reducing violence and contributing to stability and reconstruction. That way, the new President will able to harness the current perestroika to a new post-Cold War political paradigm.